Get rid of frustrating baby sleep problems and heartbreaking tears with our baby sleep guides and sleep consultations that let you get the rest you need! It’s hard to believe that the new year is almost here, and we have helped so many families get started on their journey to better sleep. As we close out 2017, we thought it would be fun to take a look back at the blog articles that our readers loved most this year! 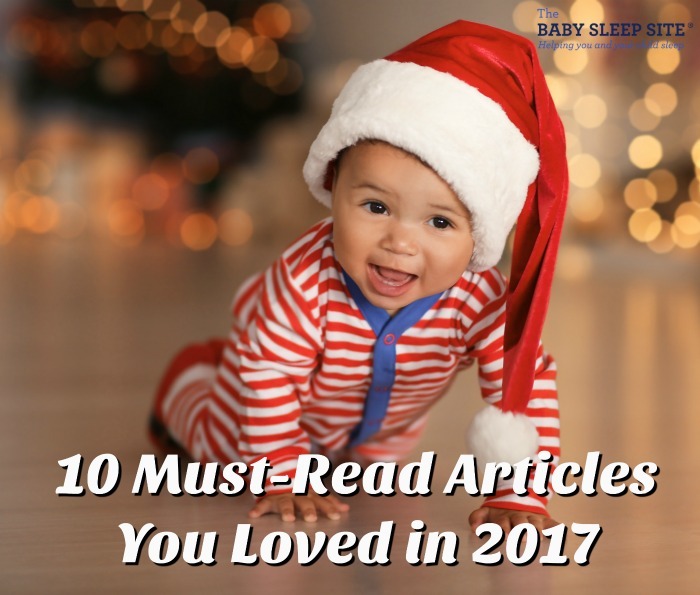 With in-depth advice on topics ranging from newborn sleep problems; to answers about early rising; to nap fighting; and top toddler sleep problems, these articles (not in any particular order!) were really popular this year. Take a look below – you may just get a new favorite too! Changing sleep habits are a pretty big deal for most of us, and starting sleep coaching is like starting a new fitness program – it takes commitment, determination and lots of support. Deciding the right time to begin sleep coaching can also be challenging for many parents. To find out if you and your baby are ready for sleep coaching, click here! 9. Sleep Regression, Phase, or Habit – Which Is Causing Your Baby’s Sleep Problems? With several sleep regressions in baby’s first year alone, it’s no wonder most parents dread the words! But given that every baby is different and regressions may hit at slightly different ages, it can be confounding to know whether your baby’s sleep changes are due to a regression, phase, growth spurt or any other number of factors. Confused about why your baby’s sleep has suddenly changed? Click here to find out why! 8. Cry It Out For Naps? Here’s What You Need To Know. It’s no secret that naps are often a lot tougher than nights when you’re talking about good, quality sleep. Daytime sleep is a lot different than night sleep and many children need more space to learn to sleep independently for naps. If you are considering a cry-it-out approach to help your baby get their best daytime sleep, click here to find out what you need to know before you start. 7. Newborn Not Sleeping? Here Are 6 Reasons Why. Most of us know that newborns sleep A LOT! And although some newborns can sleep for longer stretches during the day or night, this is definitely not true for every baby. Our article will help you get a feel for what “normal” newborn sleep looks like, and 6 reasons your newborn may not be getting enough sleep. For help putting all the pieces of the newborn sleep puzzle together, click here! Toddler-hood can be an amazing and magical time where your baby is suddenly growing into a little person, full of personality, opinions, and questions. But with all this excitement can also come some downright perplexing sleep problems! It is no wonder this was one of our most popular articles in 2017. To take a look back at how to handle the 9 most challenging toddler sleep problems, click here now! 5. Toddler Sleep Problems or Typical Toddler Behavior? Wow, readers were very interested in toddler sleep this year! Sometimes, though, it can be hard to distinguish between “normal” toddler behavior and behavior that signals some kind of larger problem or deeper issue. This can be especially true when it comes to our toddler’s sleeping habits. Click here to learn what’s considered “normal” bedtime behavior for a toddler, and what’s a sign of a more serious sleep problem. One of the questions we hear pretty frequently from moms and dads who have newborns and young infants at home is, “How can I get my baby on some kind of schedule?” The problem is, most babies are not ready for strict, by-the-clock schedules until they are about 6 months old. This often leaves parents of newborns and young babies wondering how they can bring some order and predictability to their babies’ days. Creating what we call “fixed points” in your baby’s day is a gentle way to provide some structure and routine, which in turn can help promote better sleep for your baby. Read more about how to use “fixed points” here. 3. Should Your Baby Nap in the Infant Swing? Chances are you’ve put your baby in the swing for naps at least a few times. Naps tend to be fussier times of the day for infants, after all, and many parents reach a point at which they’re willing to try anything to make naps easier. Enter the swing! But is this a good idea? Should you let your baby take naps in the swing? That’s the topic we’re tackling in our number 3 article – click here to read our take. We’ve said a lot over the years about cry it out sleep training methods. Nevertheless, this is a topic that we get lots of questions about in our Helpdesk. Specifically, lots of parents ask us when they should/shouldn’t try cry it out, and how cry it out is going to work with their babies’ personalities and temperaments. Well, you’ve asked – and now we’re answering! Click through for 11 vital dos and don’ts of cry it out sleep training, as well as tips to help you decide whether or not cry it out will work with your child’s temperament. For many families, there comes a time when mom and dad are ready to transition away from co-sleeping, and to move their baby or toddler into a crib (or a bed). But this is one of those ‘easier-said-than-done’ things, isn’t it? Way easier for me to type ‘transition away from co-sleeping’ than it is for you to actually do it! ? Fortunately, we are here to help with this process. In our number one article from 2017, we’re looking at how you can gently transition your baby or toddler away from co-sleeping – click to read! Get the Healthy and Peaceful Sleep you deserve in 2017, With Help From The Baby Sleep Site®! Ready to banish your sleep challenges once and for all, and start the new year off rested and refreshed? We can help. Our team of expert sleep consultants is standing by, ready to craft a Personalized Sleep Plan® that’s 100% personalized to fit your baby’s needs and personality, and to match your parenting philosophies and goals. Browse our list of consultation package options here. Once you make your choice and purchase, you will immediately receive an e-mail with your Helpdesk login information. You’ll be able to log in and get started right away! Want more information about how personalized help works? Check out our FAQ page here, and get answers. You can also take a tour of the Helpdesk here. Which articles were your favorite this year? Did any particular favorites stand out? Share your thoughts with us! Need Baby and Toddler Sleep Help? We Have the Resources You Need! If you are tired of wading through stacks of baby sleep books that just aren't working, if you are beyond exhausted and just can't solve your child's sleep problems on your own...than personalized sleep consulting is for you. We have been around since 2008 and invite you to tap into 10+ years of experience. Our team of expert consultants will create a Personalized Sleep Plan® just for your family and then support you through every step of implementing your plan. We encourage you to consider our personalized, one-on-one baby and toddler sleep consultation packages if you want to see real, meaningful results now. Your consultation package also includes ample follow-up help, designed to help you troubleshoot problems and tweak your plan as needed. For those persistent nighttime struggles, check out The 3 Step System to Help Your Baby Sleep. Using the same unique approach and practical tools for success, this e-book helps you and your baby sleep through the night. If you’re looking for ways to get your baby or toddler into a healthy sleeping routine during the day, explore Mastering Naps and Schedules, a comprehensive guide to napping routines, nap transitions, and all the other important “how-tos” of good baby sleep. With over 45 sample sleep schedules and worksheets, Mastering Naps and Schedules is a hands-on tool ideal for any parenting style. For those persistent toddler sleep struggles, check out The 5 Step System to Help Your Toddler Sleep. Using the same unique approach and practical tools for success, this e-book helps you and your toddler sleep through the night and enjoy a better daytime schedule. Join our Members Area packed with exclusive content and resources: e-Books, assessments, detailed case studies, expert advice, and more. As a member, you'll also enjoy a weekly chat with an expert sleep consultant. And the best part - members receive 20% off all sleep consultation services! How Rigid Should Your Baby’s Nap Schedule Be? @Katie, I’ve had the same experience! Hang in there, we are so glad to hear the blog has helped give you some tips! 8 month old up 15 times per night! 8 month old sleeping in glider with mom! Nothing working for 16 month old, not even cry-it-out! 2 1/2 year old still not sleeping all night! Get real-time help with our Expert Chat offerings! Can Your Baby Sleep Too Much? What Does Drowsy, But Awake Mean? Baby Sleep Patterns Charts - A Must-See For All Parents! Join over 450,000 parents around the world & sign up today to receive the guide and our Baby Sleep Newsletter absolutely FREE! Copyright © 2019 The Baby Sleep Site – Baby Sleep Help | Toddler Sleep Help | Personalized Sleep Consulting. Est. 2008. All Rights Reserved.